To be frank, the NHL’s handling of events like these has been nothing short of pathetic. While the Crosby hit was the most innocent (most people would agree it wasn’t suspendable), the four others were dangerous, high impact plays. Most of the offending players were guilty of negligence – except Cooke and Perry, who clearly had intent. And all the incidents, including Crosby’s, contained a defenceless victim. Between the 5 hits listed (Rome aside) there have been exactly six (6) games worth of suspensions handed out, while the injured players collectively missed nearly 1.5 years. It’s hard to know if longer suspensions would decrease the incidence of these types of plays, but it’s disappointing that the NHL has had such a laissez-faire approach until quite recently. Certainly suspensions aren’t the only means by which the NHL can try to combat head injuries. Another problem is the use of hard plastic shoulder/elbow pads, which bludgeon the chins of opposing players, causing brain trauma. In years gone by, players wore soft padding, and the effect of hits was somewhat muted because players’ bones were essentially covered by a hard pillow. (It would be very interesting to chart concussion data before and after the introduction of the hard-cap padding). The increased size, strength, and speed of today’s players is another contributing factor, but obviously one that cannot be helped. At some point, the NHL must take the safety of its players more seriously. Unfortunately in the hockey world, traditionalists begin every head injury debate with the slippery slope argument “if we make hit x illegal, we’ll eventually take hitting out of the game”, contributing to the prevailing inertia. Many intelligent onlookers have said that it may take the loss of a major star to turn the tide; here’s hoping that Crosby won’t be the necessary casualty. This entry was posted in Uncategorized and tagged Aaron Rome, Brendan Shanahan, Claude Giroux, Colin Campbell, Corey Perry, Dave Steckel, David Booth, Hockey concussions, Marc Savard, Marc Savard retirement, Matt Cooke, Mike Richards, Nathan Horton concussion, NHL concussions, NHL head disciplinarian, NHL head injuries, NHL suspensions, Patrice Bergeron, Randy Jones, Rome hit, Sidney Crosby concussion by Peter Siamandas. Bookmark the permalink. 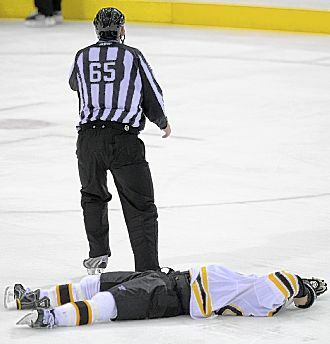 The NHL should start the 2011-2012 season with harsher punishments. Issue a statement that these kind of hits are unacceptable and from this point forward a larger suspension will occur. Not playing in 1-4 games in an 82 game season is nothing. In the NFL, if a player gets suspended and misses just 1 game that is more of an effect that missing 5 games in the NHL. good article but you can’t use the richards and cooke hits because by the letter of the law at the time of the infraction, those hits were completely legal. Only after this hits did the league sit down and formulate the blindside rule. Seeing as the Rome suspension was given down by Mike Murphy, the same Mike Murhpy who “saw no clear evidence” of Burrow’s bite, I believe this suspension was as simple as who is the surris, MB native Aaron Rome in the grater scheme of things. Who is Nathan Horton? had Horton not been so injured in such a vulgar manner no way Rome gets 4 Cup Final Games. If thats Bieksa hitting Peverly and he goes to the bench and then leaves with an “UBI”, one game at most. This is clearly a Disposable player who is used by the nhl to send the mainstream media that “hey we are strong on concussions” message during a highly viewed game. The NHL Wheel of Justice is a joke, hopefully Shanny can fix that by giving everyone their fiar due in a consistant manner despite of the name on the back(on both the hitter and the hittee). I think you just love Richards too much… His hit was comparable to Rome’s.